A game inspired by the labyrinth of Daedalus, set in a life-size maze. 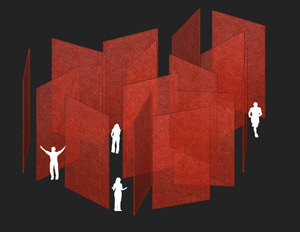 In Cross My Heart + Hope to Die, three teams of players sneak and chase in a life-sized maze. The Hero, the Princess, and the Monster seek each other out, while their teammates create new walls in the labyrinth to protect them and to corral their targets. Can your team capture the heart of another character? Or will your teammates betray you and switch teams? Part myth, part puzzle, and part life-sized videogame, Cross My Heart + Hope to Die demands stealth, teamwork, and social smarts. Nathalie Pozzi is an architect whose projects cross the boundaries of art installation, architecture, and landscape. Trained in Venice, Stockholm and Helsinki, Pozzi explores the classical design of space and light and the elegant use of materials, while also incorporating social and ethnographic elements into her work. Her projects expand the possibilities of architecture from building beautiful structures into a global and cultural act. Eric Zimmerman is a game designer who has been working in the game industry for more than 16 years. He was the co-founder and chief design officer of the independent game development company Gamelab. His game design work also includes the critically acclaimed SiSSYFiGHT 2000 as well as dozens of real-world social games played at conferences and festivals. He is the co-author with Katie Salen of Rules of Play: Game Design Fundamentals. Eric has taught courses on game design at MIT, The NYU Game Center, Parsons School of Design, and School of Visual Arts.